Rainy days are for Reading. 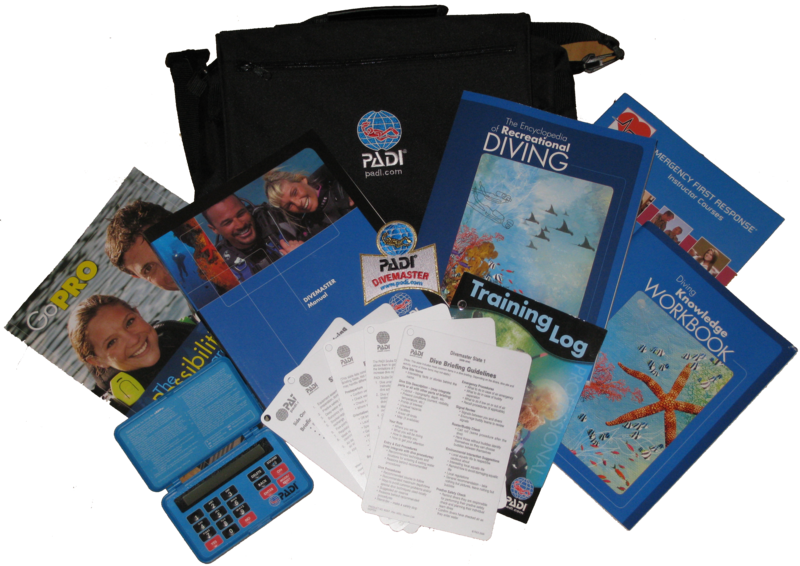 I’ve toyed with the idea of going pro with Padi for about two years now. Mostly the cost held me back, I’m not a financial guru, and am trying to pay off some good ‘ol credit card debt. However after seeing a notice that Eco Dive Center was looking for current and new instructors for an anticipated busy summer, I immediately emailed Ron the owner. He and his wife Beth thought I definitely should go for it, and agreed to help me get there and quickly. I met Beth at the dive shop last week to pick up the materials for the first two certifications I need to complete prior to instructor: Rescue Diver and Dive Master. We planned out the schedule for DM classes then she went to grab my books. The Rescue materials seemed pretty easy and normal. 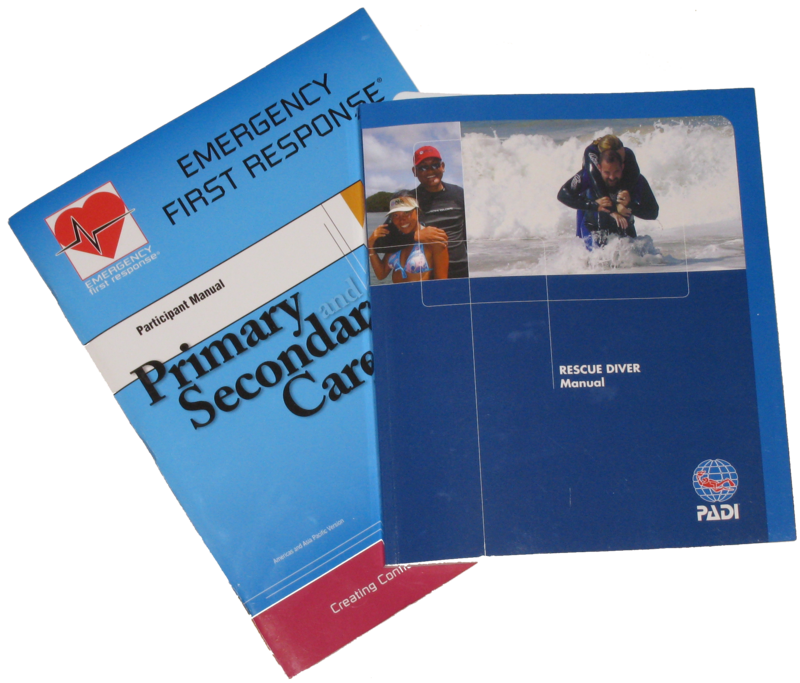 Just the usual Padi manual and a manual for the EFR certification. Then she went to get my Dive Master Materials. Returning she was holding a briefcase. My first thought was cool a briefcase! Then it was opened and out poured all the books. Well after getting home that night and looking through everything I realized its not that much. After the rescue and EFR manuals, I have the DM manual and the Encyclopedia of Recreational Diving to read through. There is a study workbook that goes with the encyclopedia which is only knowledge reviews for encyclopedia sections. Two are just pamphlets talking about going pro, and the EFR Instructor course (another GIANT binder I will be getting because I have to be an EFR Instructor to be a Dive Master). There is the new eRDP which I believe is replacing the old RDP and the Wheel. (its good because I never learned the wheel!) I played with that for about 10 minutes and its a piece of cake…it basically takes all the thought and math out of the process of planning your dive, just enter the numbers and it gives you limitations. Finally there are several slates which will be used during my training and once I’m a certified Divemaster. Luckily for me the weather this weekend is not the typical lovely sunny Los Angeles weather. We’re getting rain (real rain, not just a light misting that freaks everyone out). So here I am this morning curled up in bed with a cup of tea and my Rescue Manual working my way through and enjoying the rain from my window. Once I get through this its on to the next. Hopefully I can read everything before I start my classes in two weeks so that I just have to review the section thats being covered each time. Fingers crossed…now where’s my highlighter? The title for my first ever post on this blog adventure is from a friend’s Facebook page. I love it and agree with it wholeheartedly. I suppose before I jump right in with dive reviews and training adventures you “soon to be readers” would like a little history. My name is Kelli and I’m an avid SCUBA diver living in Los Angeles. I’ve been certified since 2003 and dove sporadically on Hawaii vacations for the first couple of years before moving from the desert to the ocean and being able to dive more regularly. I love diving in California. While the colors on the reefs and in the kelp forests are not as vivid and varied as the tropical reefs there is still beauty to be found. I spent 2009 training for an Ironman race (Arizona, finished in 14:41:07 of which I’m very proud) and it took up all my time and energy which meant no diving for the majority of the year. I’ve decided to make up for that in 2010 and have gone overboard by finally giving into my desire to “Go Pro.” I have three certifications to get through, and with the help of my local dive shop (ECO DIVE CENTER – check them out, they’re the best!) I will be moving through these last three certifications throughout the summer. I am also extending my base of knowledge by learning how to create a website through a CMS called Joomla. Eventually the site will house this blog, a portfolio of my underwater photography, videos, dive site reviews and more. So welcome aboard to anyone who might stumble to this blog, and I hope you enjoy what you read.